Your ceremony says a lot about you as a couple. It literally sets the tone for the rest of the wedding celebration. Traditional or playful? Dramatic or intimate? 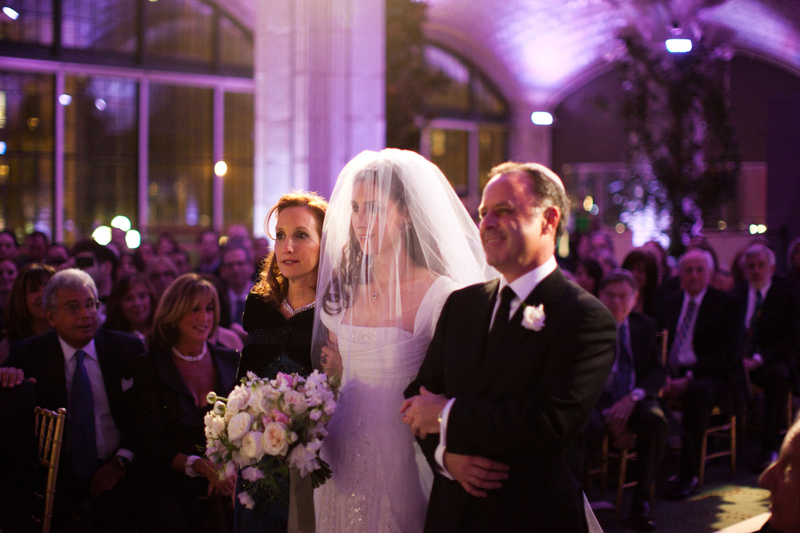 A customized and meaningful ceremony is the secret ingredient to any fabulous wedding. It creates a unique energy which your guests carry with them from the ceremony to the rest of your celebration, and that’s the difference between “just another party” or “wow, what a night”. Which is why I strongly encourage every couple to personalize their ceremony. That includes reviewing what your officiant plans to say, customized readings, vows, programs and music. Choosing meaningful music is a great way to make your ceremony, well, your ceremony. I’ll never forget watching one of my first brides (Christine, I’m talking about you!) walk down the aisle to an acoustic piano version of Bruce Springsteen’s Secret Garden, and there wasn’t a dry eye in the house. A few years later, Brooke walked to a classical quartet performing U2 All I Want is You. A trend was emerging, and while it was quite risqué at the time, it’s now completely acceptable to literally march to a different beat on your wedding day. In 2009, this video of a bridal party dancing down the aisle went viral, and it set a new bar for customizing a ceremony with music. While it might feel too non-traditional for some, there’s still something appealing about creating the type of anticipation seen here. Can’t you just imagine the energy on their dance floor later that night? For those couples looking for alternatives to classical ceremony music while still grappling with their desire for tradition, there’s good news. Star Talent’s Rock and Pop strings. These classical musicians have a repertoire which includes everything from Abba to Zepplin. Your favorite hip hop song sounds more than just respectable; it’s cool and classic at the same time, allowing you to incorporate your favorite song in a way that surprises and delights your guests (and doesn’t upset your mom, dad or grandma). Michael Taylor, owner of Star Talent and creator of Rock and Pop Strings, agrees that customizing ceremony music is an emerging trend. Brides and Grooms don’t want “predictable” music. Recent ceremonies have included Bridal Parties entering to Journey, Black Eyed Peas, Train and Kanye West. Brides selecting U2, Oais, Coldplay or Sting for their ascent down the aisle. All of these song ideas are transcribed for string ensemble and arranged in a manner suitable for an elegant ceremony. Check out Star Talents blog to hear samples of some of their arrangements. You won’t believe how good AC/DC’s Back in Black sounds when it’s played as classical music. Favorite song or movie theme? No problem, for a bit extra, they’ll score it and learn it for your wedding. You can even intersperse contemporary with classic, punctuating different parts of the ceremony. When choosing songs, remember there are many components and moments to customize music; Prelude (1/2 hour prior to the ceremony as guests arrive and take their seats), Bridal Party Processional (as the bridal party and Groom walk the aisle), Brides Processional (song just for the bride), and let’s not forget the upbeat Recessional (song once the ceremony has concluded). Below, a few suggestions from their repertoire. And one final bit of advice; don’t be afraid to mix classical with contemporary. There are no wrong answers, only what feels right for you. ← What makes a party great?